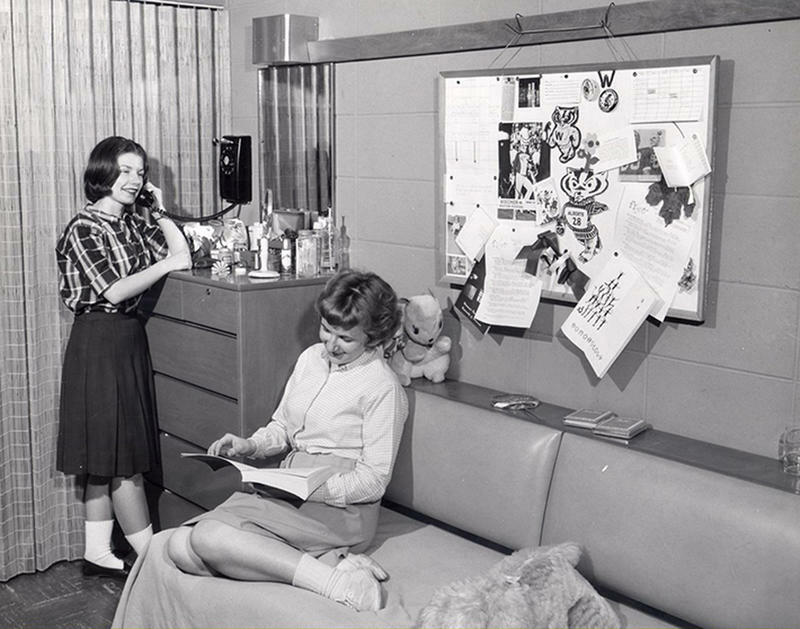 When it comes to college dorms, some things never change. 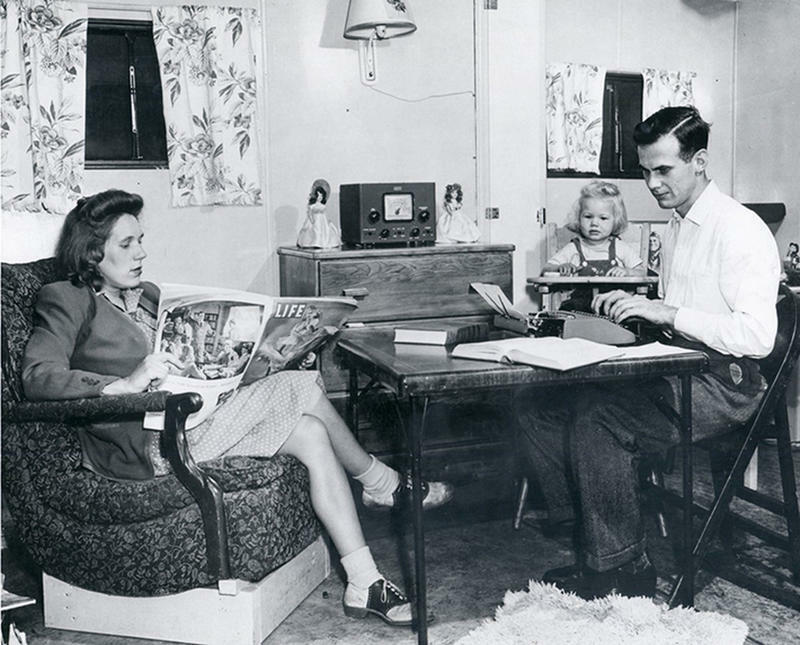 It may have modernized over time (WiFi, TV, air-conditioning, etc. 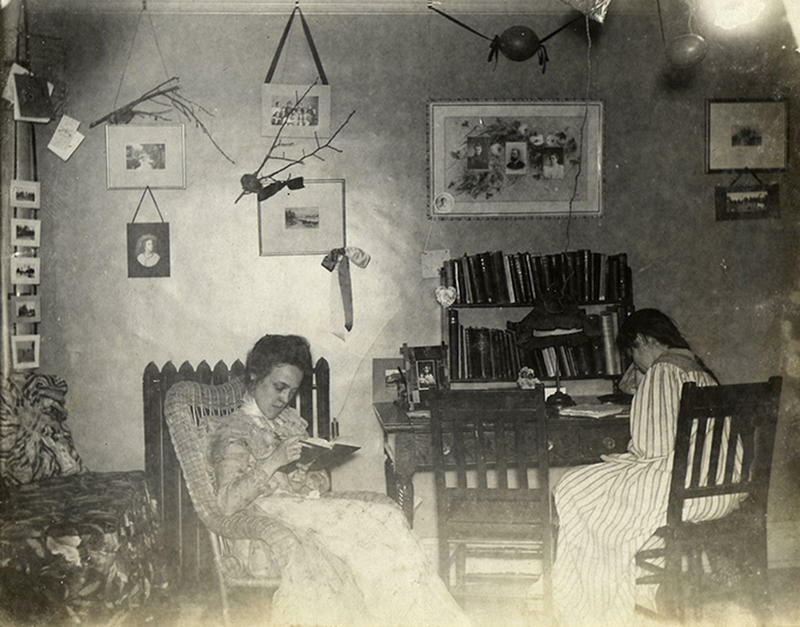 ), but when you see these college dorm photos, put together by the University of Wisconsin-Madison's archives department over the course of 110 years, you'll notice how family photos are still hung on walls and how students still chill out with their friends in their rooms - some things never change. 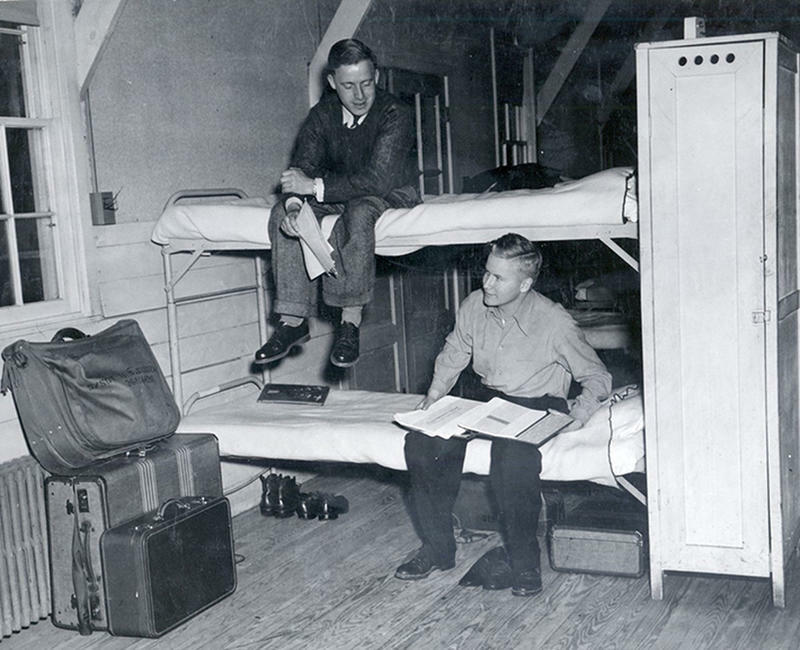 Get a nostalgic tour through this incredible collection of old-timey dorm photos. Enjoy! 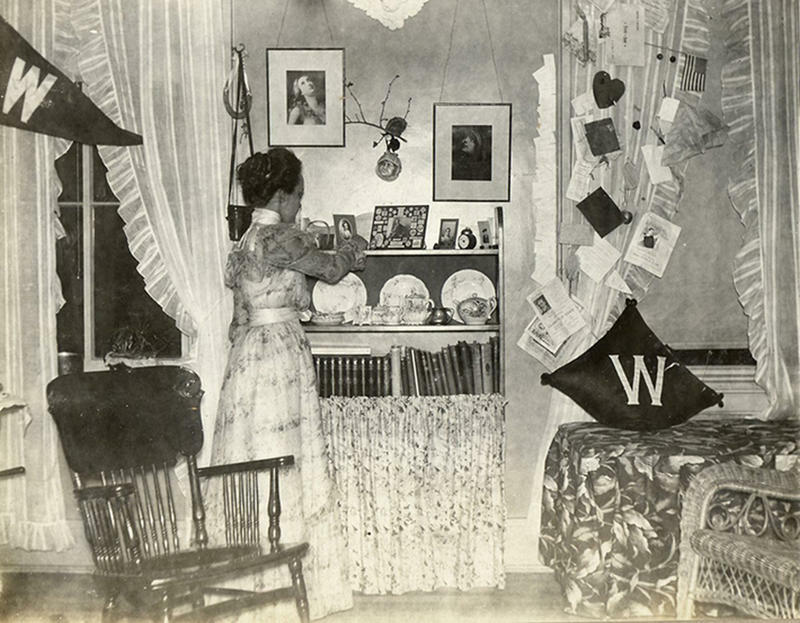 A woman's dorm room in 1898. 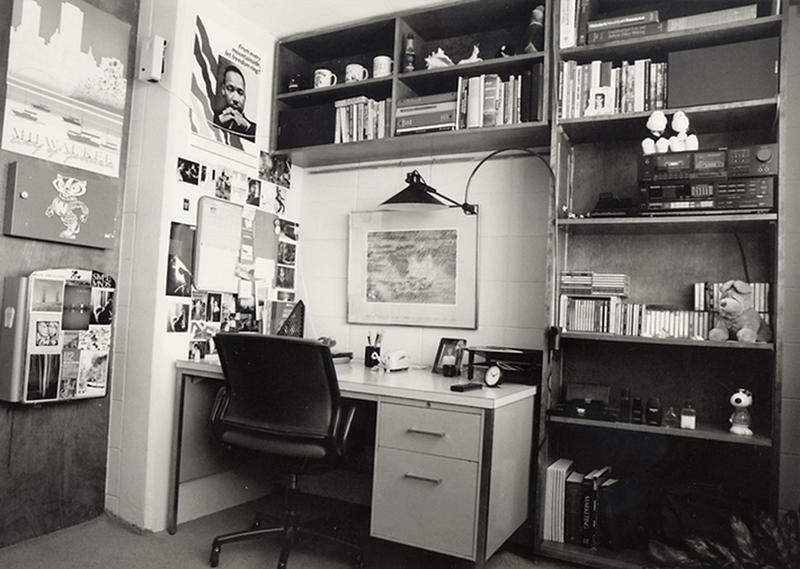 Times might have changed but a dorm room's essentials stays the same: pennants, books, and a chair for studying. 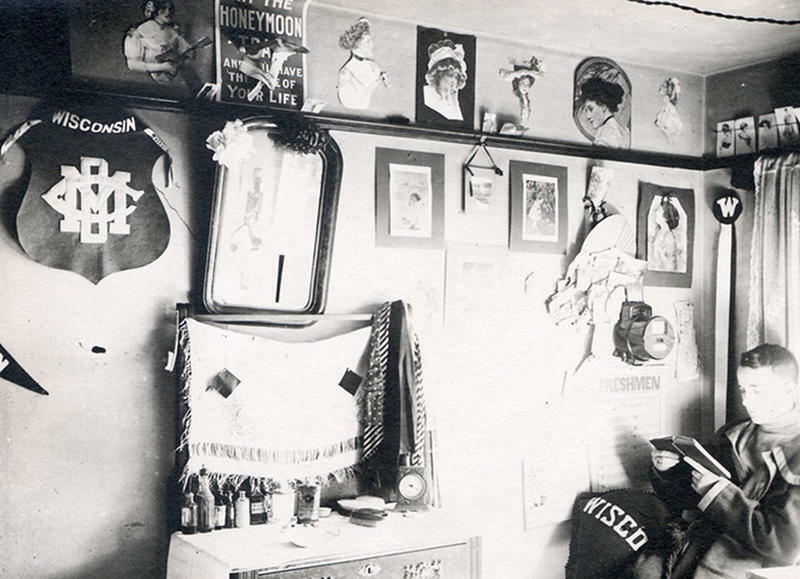 The pictures and mementos gave this 1899 dorm room a rather homey vibe. 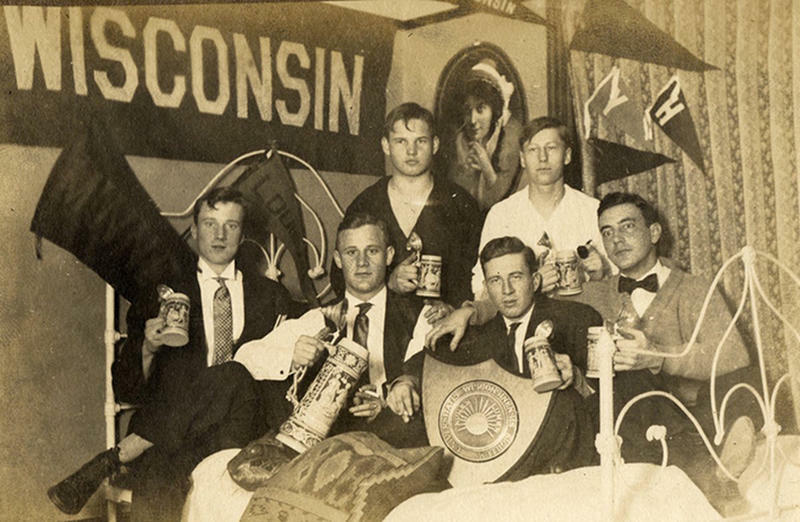 Male students raise their glasses, 1909. 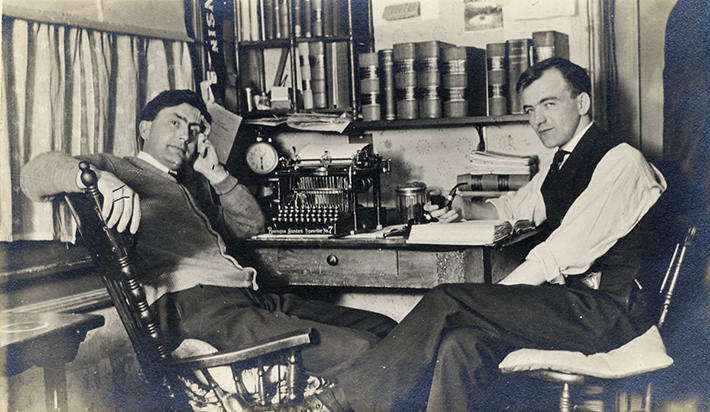 Check out vintage typewriter in this 1909 photo. 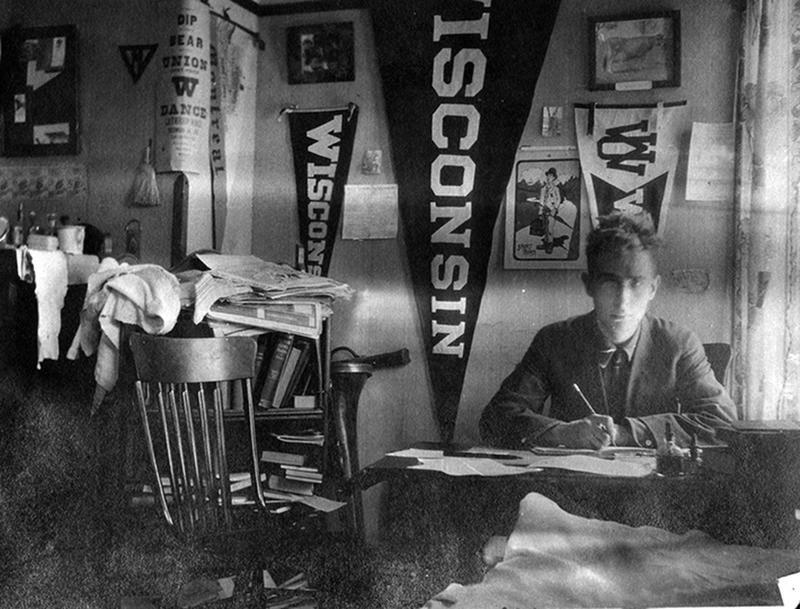 This 1912 or 1913 photo oozes out real college pride. 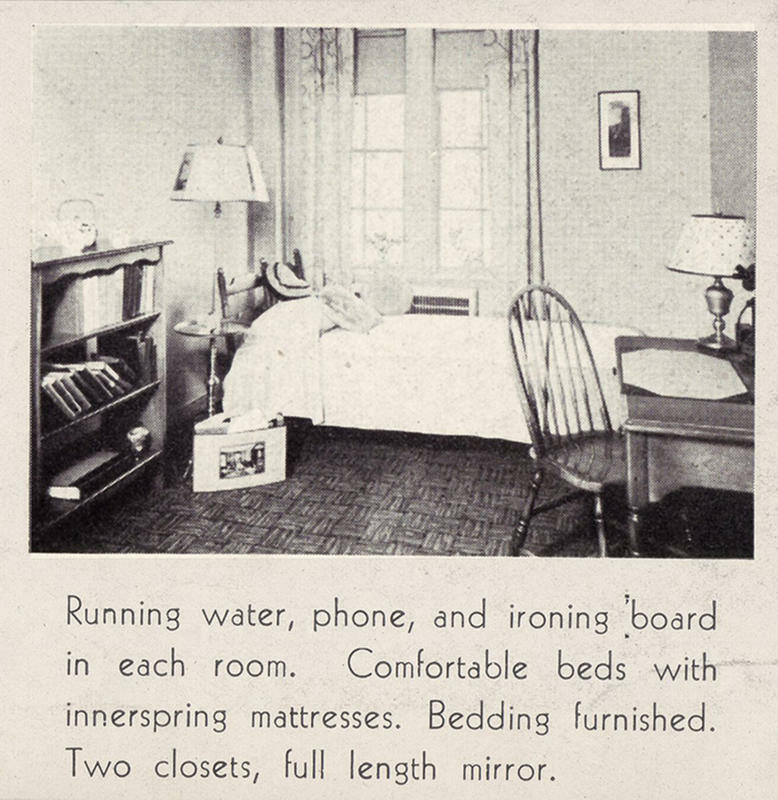 "An advert for a dorm room in 1927 highlights perks like running water, a phone, and an iron." 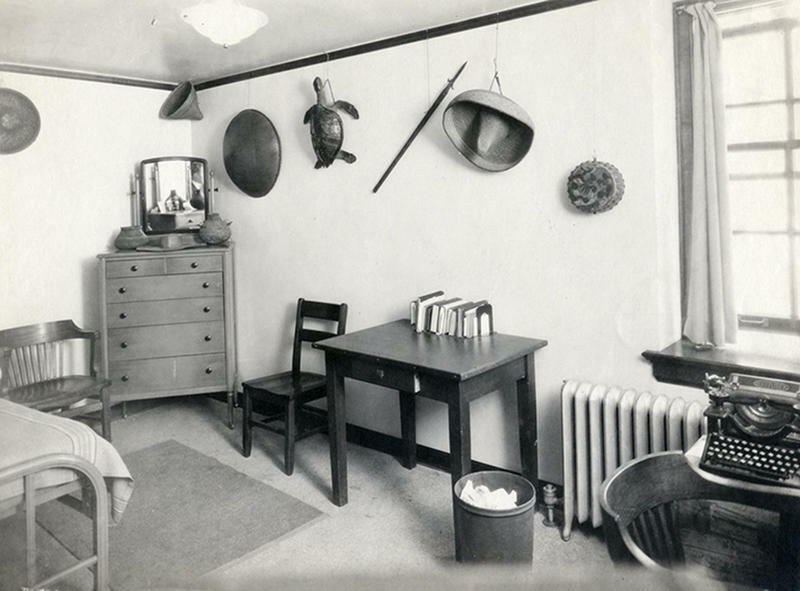 A 1930's single college dorm room filled with exotic souvenirs. 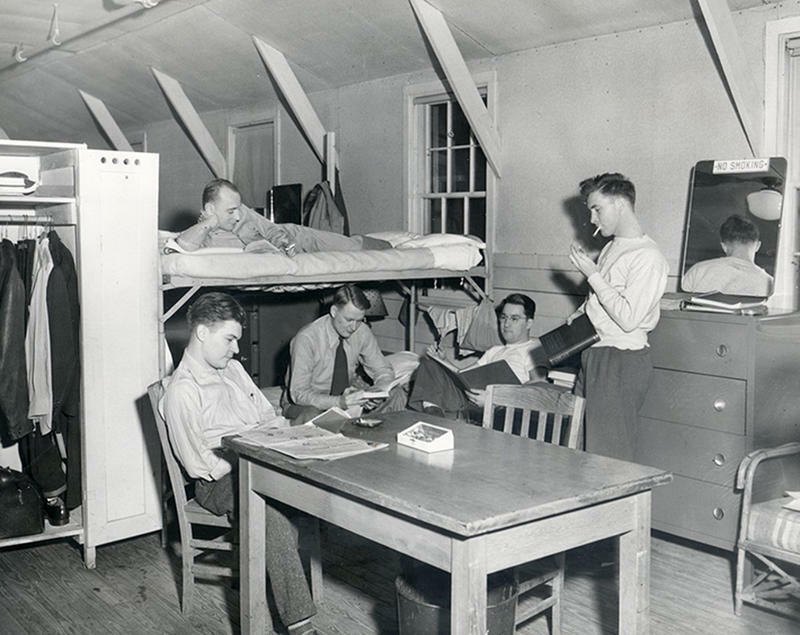 In 1945, single men's housing was at $13 per month. Smoking was banned, apparently not for this guy. 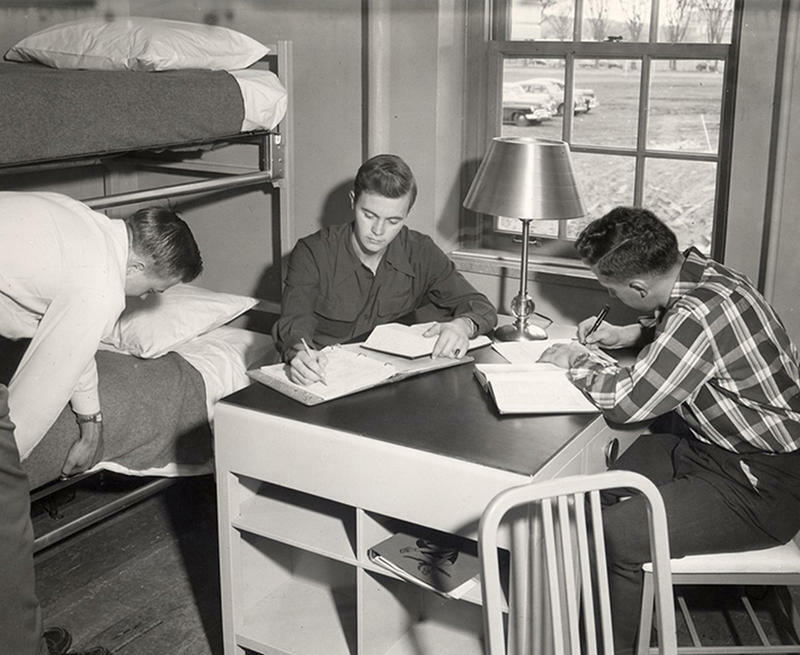 "The university had separate housing for married students and families, as seen in this 1946 photo." 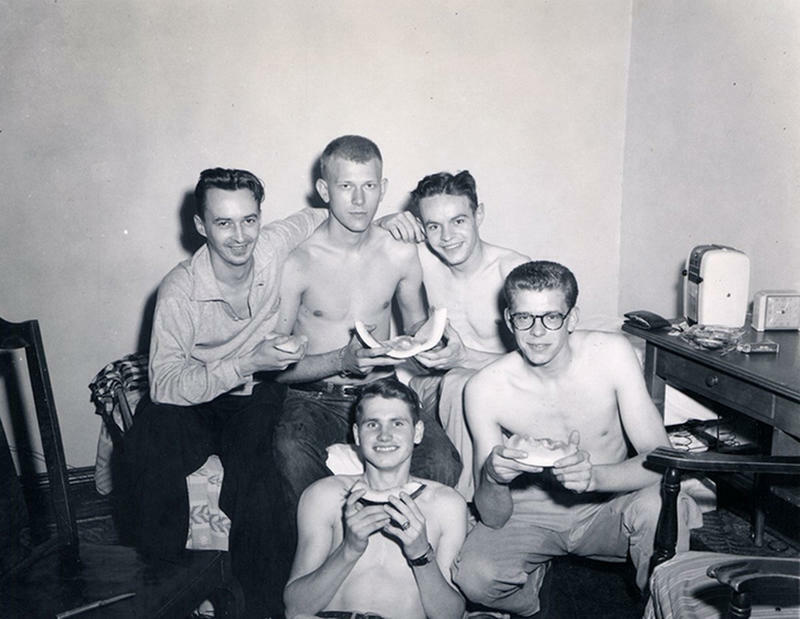 Students "hanging out" while eating melon, circa 1950s. 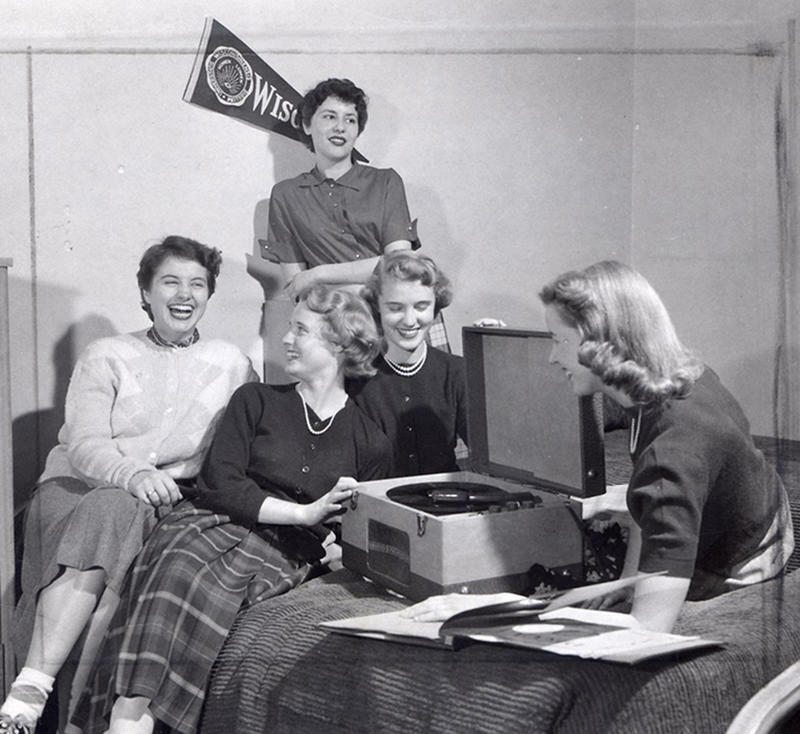 Women listening to music in a girls dorm, 1950s. 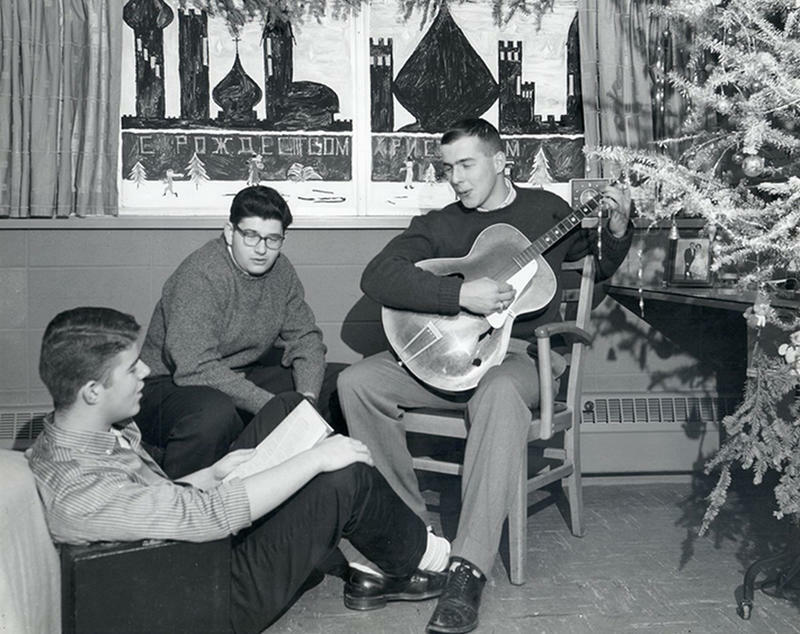 The Russian mural at the back reads "Merry Christmas," in this 1958 photo. 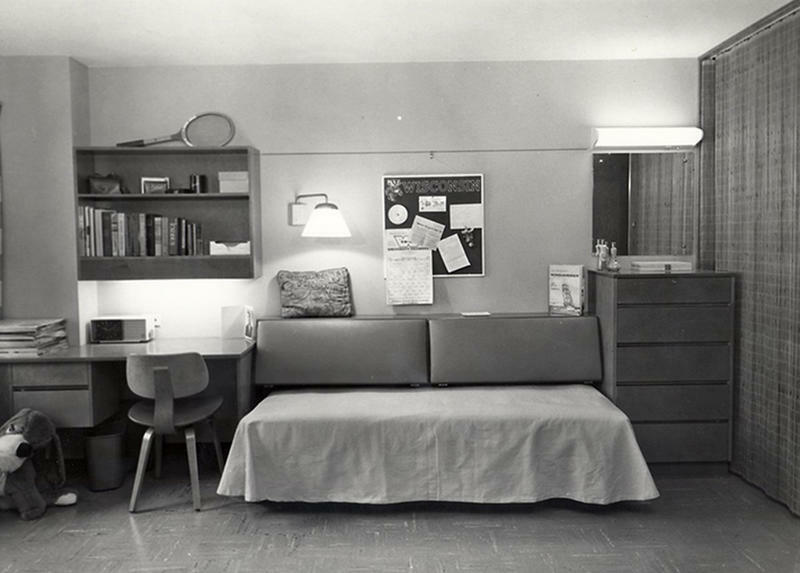 One student prefers minimalism, 1960s. 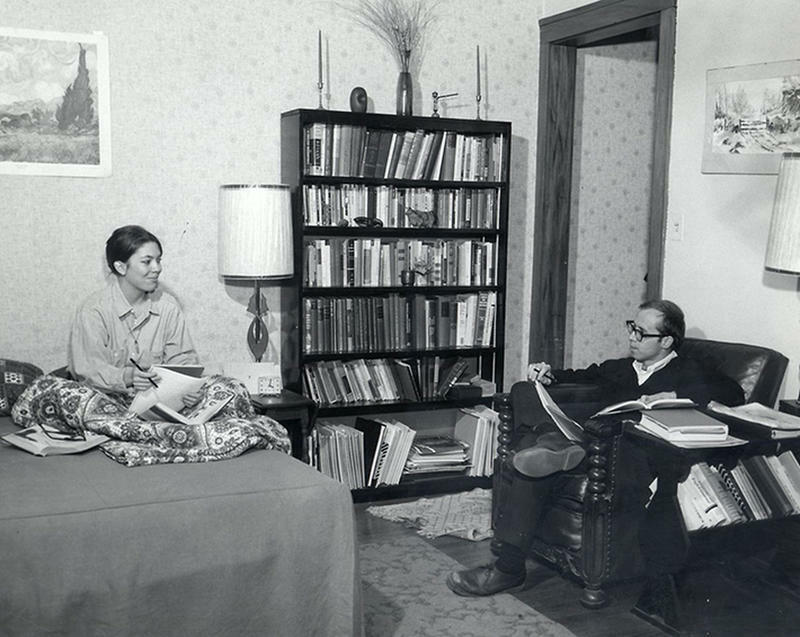 "Special housing for married couples remained through the 1960s." 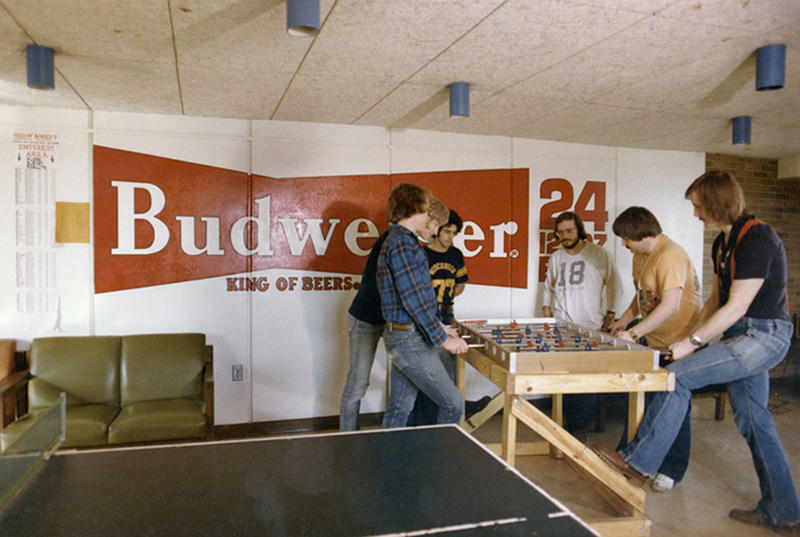 This 1970s student lounge had communal games like foosball and ping-pong. 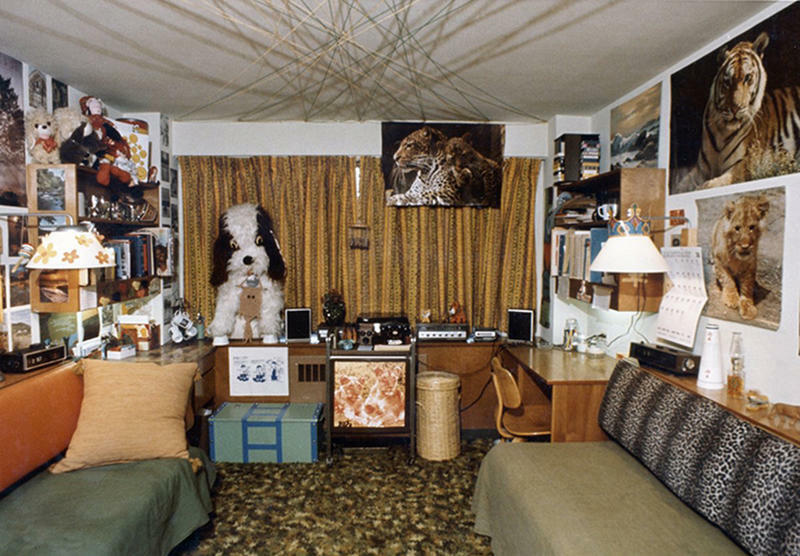 A groovy dorm room, 1970s. 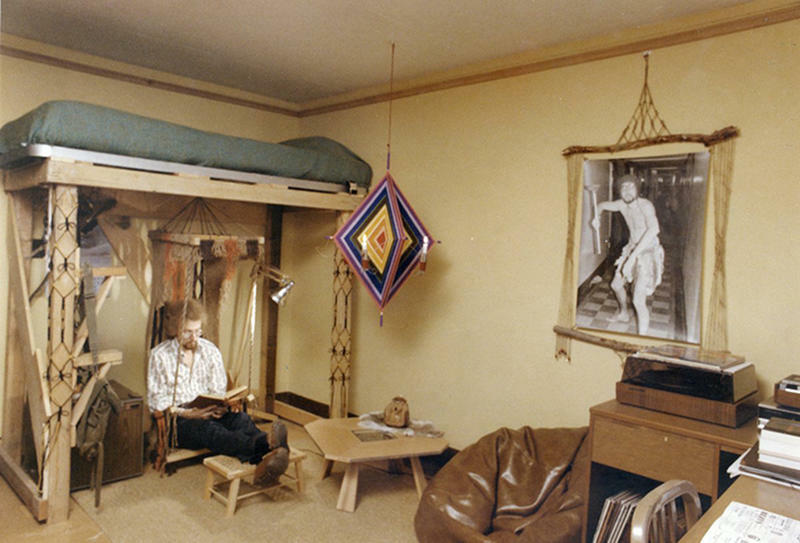 One student went the modern minimalist route touch lofted bed, hanging chair, and dream catcher. What's up with the ceiling? 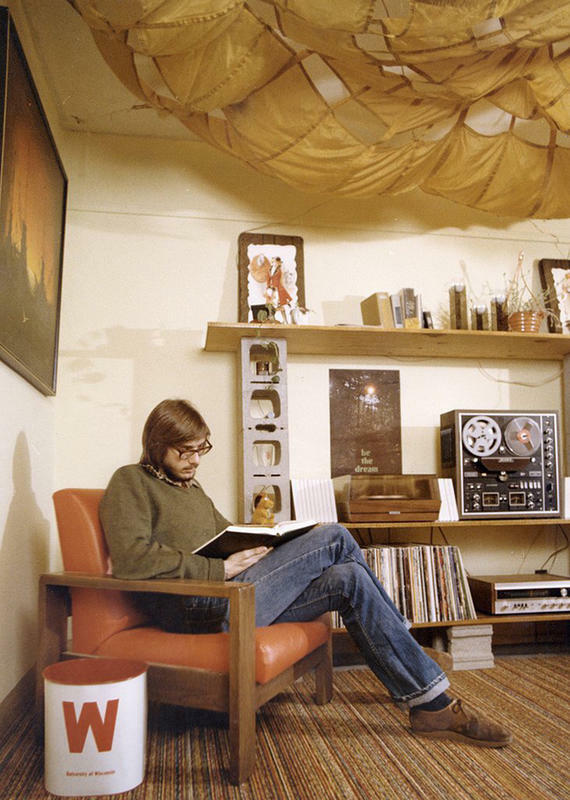 Circa 1970s. 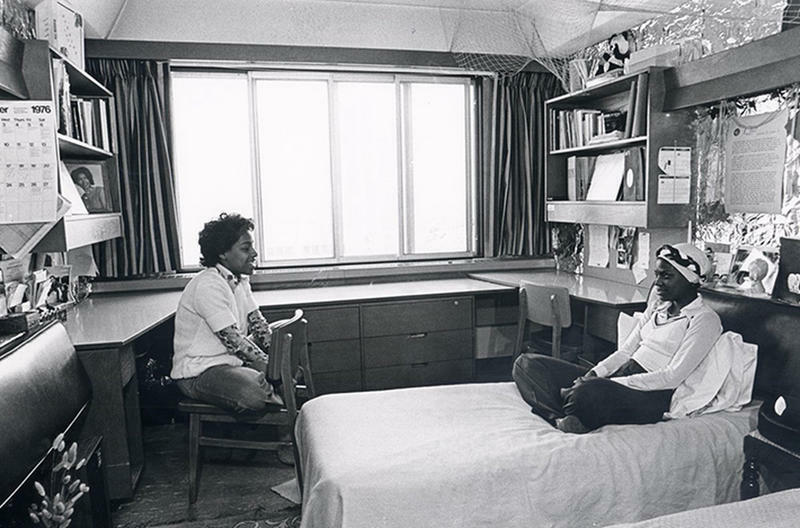 Two women catching up in a dorm room in this 1970s photo. 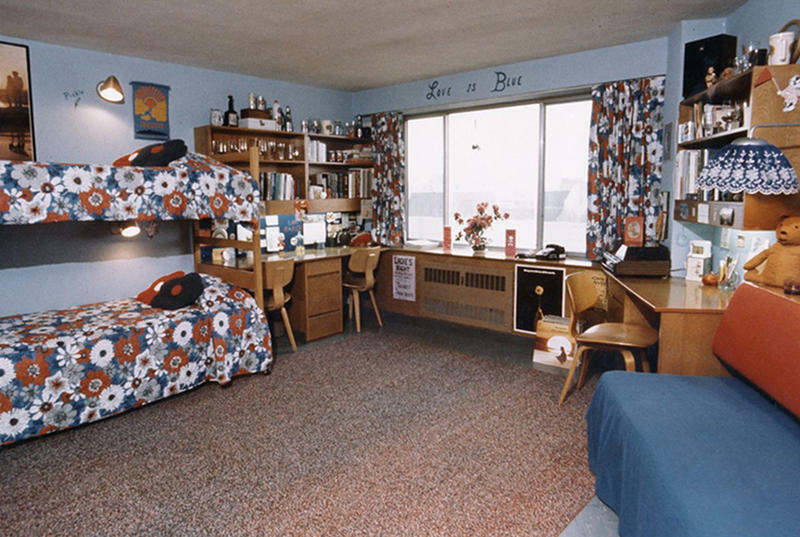 Also from the '70s... "Love is Blue." These guys are geniuses! 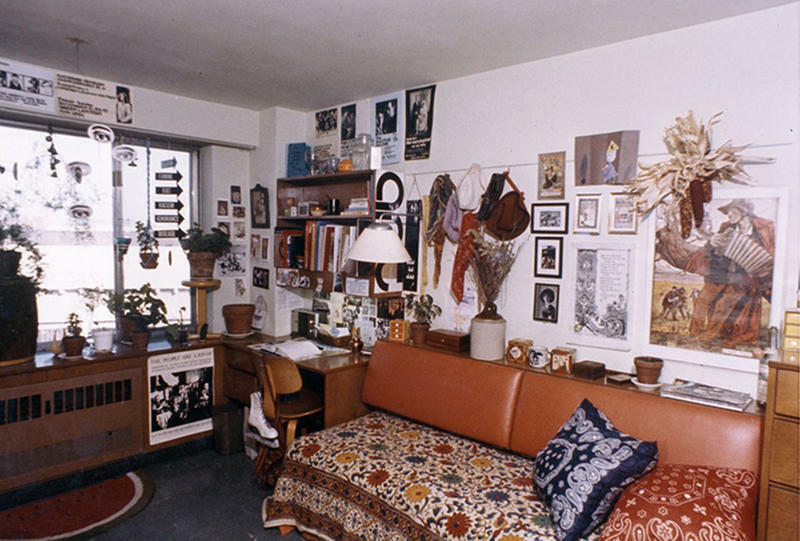 Photo circa 1970-1980. 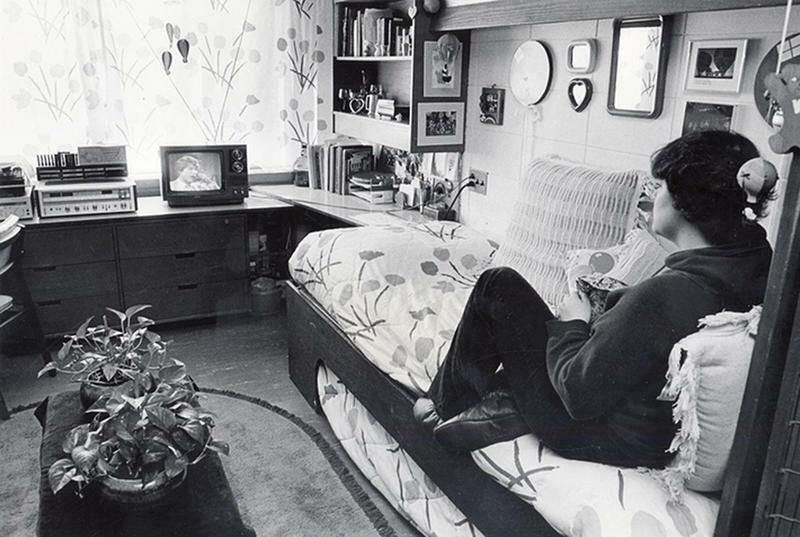 "In the early 1980s, TVs started appearing in dorm rooms, distracting students everywhere." 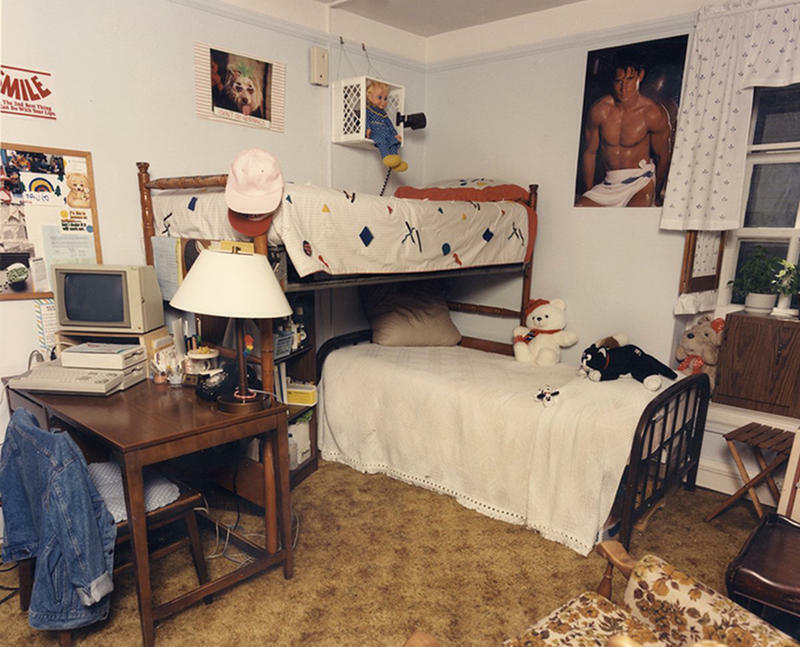 This dorm room had lots of personal touches, 1980s. 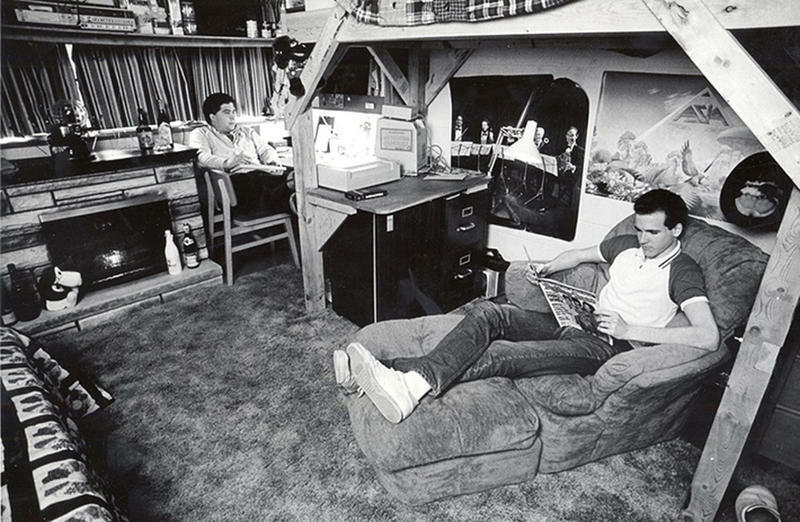 This 1986 photo features a fireplace, a rare luxury for a college dorm. 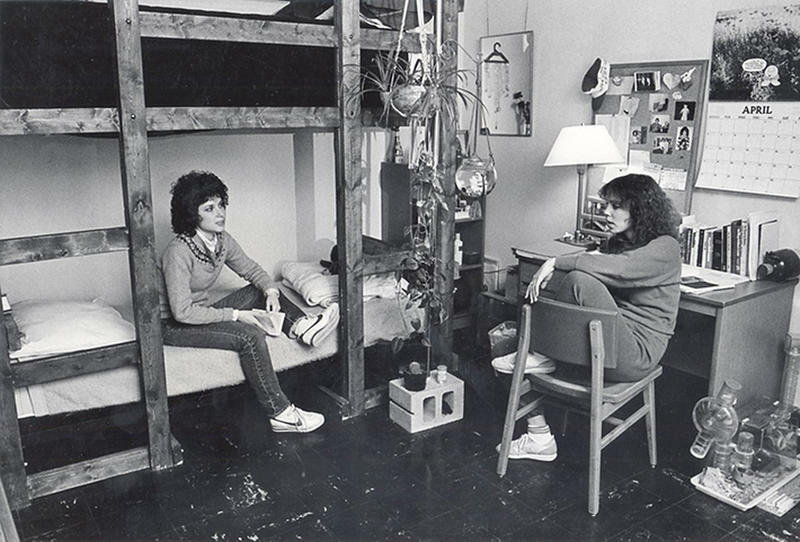 Women's dorm screams in 1987. 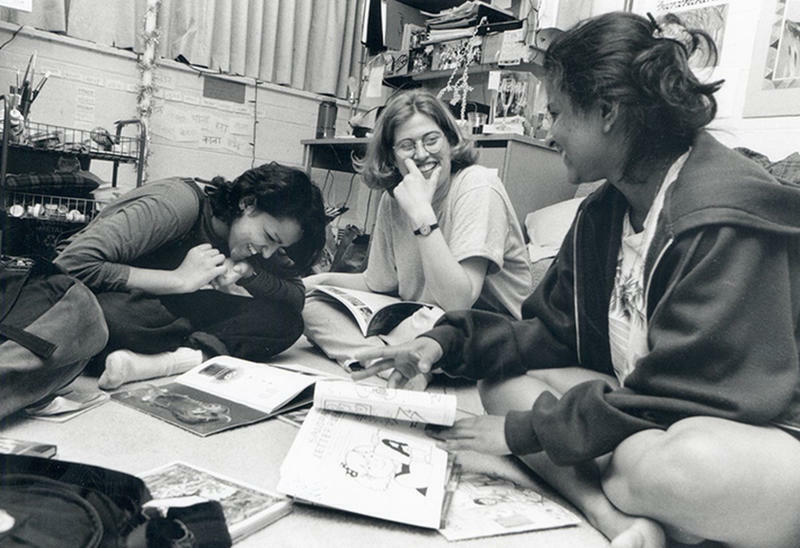 "Students gathered to study in a residence hall den in this 1996 picture." 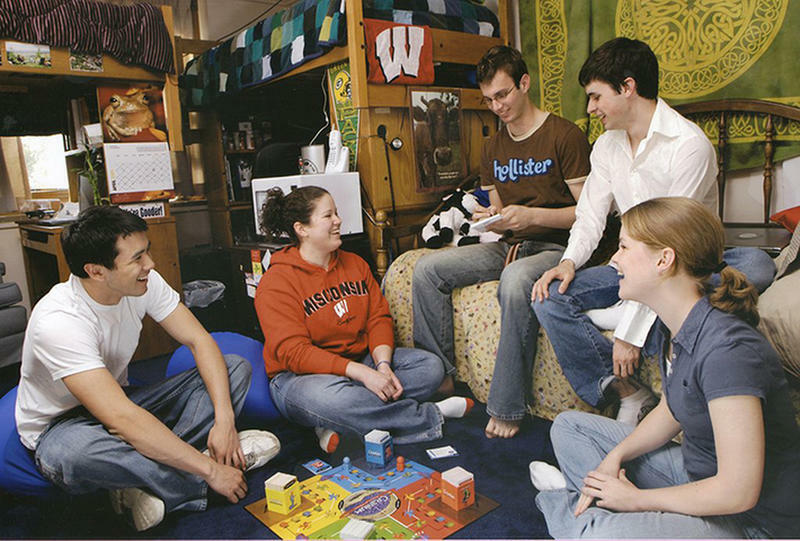 Students chatting in this 2008 picture.